From the contrapuntal rigours of Bach, to the coruscating soul-searching of Rachmaninov, to the perfumed velleities of Chopin, Vladimir Feltsman seems to be sovereign over every idiom he plays and records. Of modern pianists vying for the meaningless title of World No. 1, Feltsman must be up there with the likes of Sokolov, Volodos, Kissin, Pollini, Zimerman, Perahia, and, so as not to be sexist, Pires and Argerich. 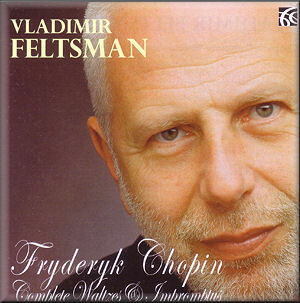 Every piano maven from here to Carnegie Hall will want to dispute, correct and modify that fairly random and doubtless incomplete roll of honour, but I hope that I may at least be allowed to observe that Feltsman is now surely in his mature prime, having a string of critically lauded recordings for Nimbus to his credit and performing to acclaim worldwide. Coming to this recital having already very positively reviewed his “Tribute to Rachmaninov” and Bach English Suites for Nimbus, I was predisposed to like what I heard and was immediately struck by the ease and naturalness of his treatment of the celebrated E-flat major waltz which opens this recording. My enjoyment of the playing, already intrinsically great owing to the quality of Feltsman’s pianism, was greatly enhanced by reading the highly intelligent, informative and stimulating essay provided in the booklet by the pianist himself. As with previous Nimbus issues, the sound is simply lovely: bright yet warm, as utterly beguiling as Feltsman’s playing. His command of rubato and rallentando is subtle and deeply satisfying, never “applied” but always cognisant of the need for a degree of Schwung to recall the origins of the music in dance. This elasticity, grounded in the dominant figure of one long and two short notes, is key to our enjoyment of these most cheerful of Chopin’s generally melancholy output. His choices of tempi are generally as airy as his playing yet there is no sense of hurry, just an insouciant propulsiveness. I have remarked while listening to his Bach at the fleetness and lightness of touch Feltsman can command; he is the most deft of practitioners yet the left hand is always weighty and sonorous when required. In my experience only Vasary and perhaps Freire are as ethereal yet soulful; I listened to the whole disc straight through with unalloyed delight. The four Impromptus forming the coda to the sequence are delicate and rhapsodic by turns. They are evidently a little more serious and quizzical in tone, posing some questions more searching than the generally reassuring waltzes. This goes straight to the top of my list of favourite Chopin CDs; I begin to wonder if there is any mode or composer in which this magnificent artist cannot excel.